Marshall M. Fredericks Sculpture Museum | ICD patient Daniella Acanfora shakes hands with Denmark's Ambassador to the United States, the Honorable Henrik Kauffman and Mrs. Kauffman as she presents the ICD Scroll of Gratitude to His Majesty, King Frederik IX of Denmark. ICD patient Daniella Acanfora shakes hands with Denmark's Ambassador to the United States, the Honorable Henrik Kauffman and Mrs. Kauffman as she presents the ICD Scroll of Gratitude to His Majesty, King Frederik IX of Denmark. ICD patient Daniella Acanfora, a double-legged amputee child, shakes hands with Denmark’s Ambassador to the United States, the Honorable Henrik Kauffmann and Mrs. Kauffmann as she presents the ICD Scroll of Gratitude to His Majesty, King Frederik IX of Denmark. 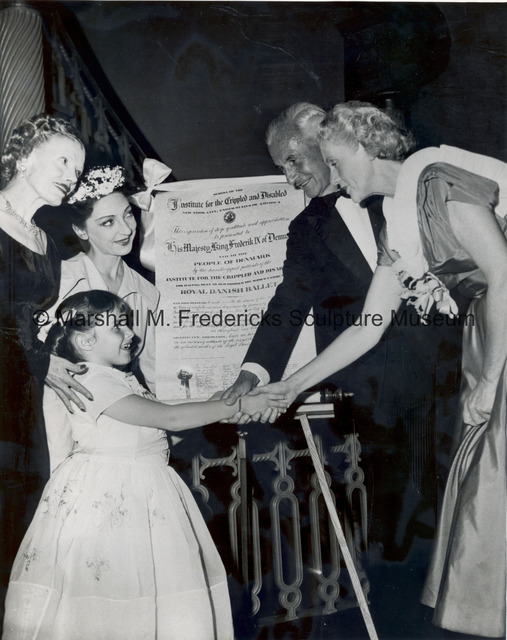 Looking on at left are the late former American actress Helen Menken, then Vice President of the ICD; and the Premiere Ballerina of the Royal Danish Ballet. “ICD patient Daniella Acanfora shakes hands with Denmark's Ambassador to the United States, the Honorable Henrik Kauffman and Mrs. Kauffman as she presents the ICD Scroll of Gratitude to His Majesty, King Frederik IX of Denmark.,” Marshall M. Fredericks Sculpture Museum, accessed April 22, 2019, http://omeka.svsu.edu/items/show/4945.